The Southeast Asian nation has emerged in recent years as a key transit hub for the multi-billion dollar illicit wildlife trade, with demand for products made from tusks, pangolin scales and rhino horns high in China and neighbouring Vietnam. According to the Mondulkiri Project, an animal rescue NGO, there are about 400 elephants in the wild in Cambodia, and about 50 held in captivity. 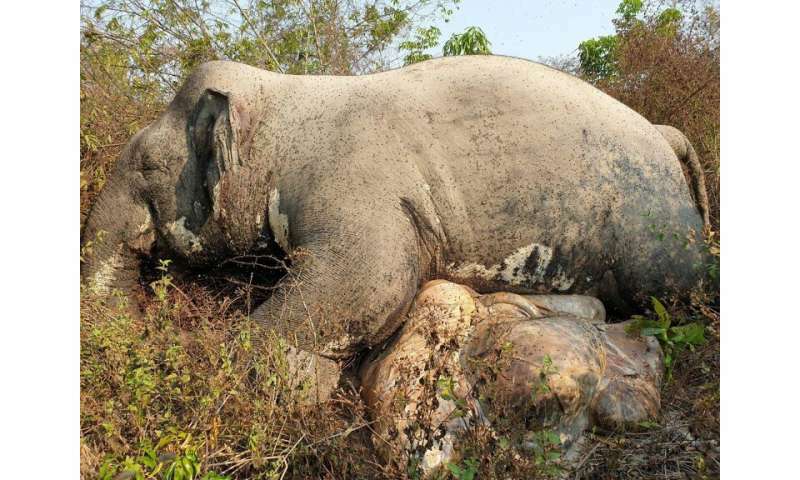 The body of the male Asian elephant was found on Sunday in a wildlife sanctuary in northeastern Mondulkiri province, said Environment Ministry spokesman Neth Pheaktra. "The elephant's tusks were missing and its tail was also cut off," he told AFP on Monday, adding the animal was killed about 10 days ago. "There was a wound from a gunshot under its right eye," Neth Pheaktra said, adding authorities are still hunting for the poachers. A baby elephant was found dead last year in the same sanctuary when it was caught in a trap set by poachers, he said. The Asian elephant is hunted for its precious tusks, while its tail hair is considered lucky and embedded in rings and bracelets. The demand for the animal parts threatens Cambodia's dwindling elephant population found in the northeast and southwest forests, where illegal logging and deforestation is reducing their habitat. Cambodia's high levels of corruption and lax law enforcement make the country an easy transit point for traffickers facing a crackdown in neighbouring Thailand. In December, Cambodian authorities seized more than one thousand elephant tusks hidden in a storage container sent from Mozambique, the country's largest ever ivory bust. Another significant haul occurred in 2016 when authorities discovered nearly a tonne of ivory hidden in hollowed-out logs inside an abandoned container—also owned by a company based in Mozambique.